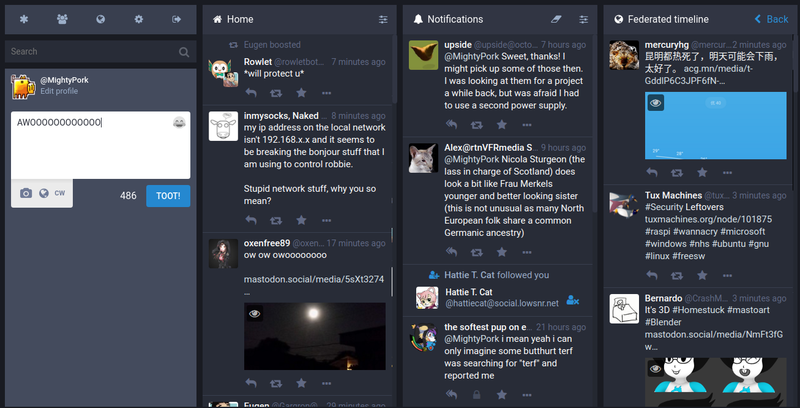 Unless you were in a coma for the last couple months, or live in a cave, you will have heard of Mastodon, the new decentralized, open source Twitter alternative. Is it viable, and should you switch? I'll try to give some answers. I'm in the process of completely moving over, but will keep Twitter open for the time being. It's decentralized, so there is no greedy company running it for profit and flooding the platform with ads. There is also no built-in big-brother-style tracking. Search engines might crawl your posts, however, if you make them public. Decentralization means there is no central server or website, either. Instead, there are thousands of interconnected servers (called instances) run by thousands of admins, for the better or for worse. The platform integrates with GNU Social, so you get to mute or block RMS, who posts a lot of inflammatory garbage, 24/7--judge for yourself. Tweets are now Toots, because of elephants and trunks and stuff. Retweets are "boosts". Now, you may be curious how this all works with no central server. Handles are no longer just @name, but @name@server. For example, I'm presently @MightyPork@mastodon.xyz. The leading @ is sometimes left out, making it look like an e-mail address, but it's not. The servers talk to each other (it's called federation) and exchange the toots and info in real time. If all goes well, you won't even notice. There are no DMs, but you can send a private toot instead, or one that goes only to your followers, etc. It's much more flexible. If you're into this privacy stuff, you can also "lock" your account in a similar fashion to how protecting works on Twitter. It's not possible to have everything in the public timeline. Instead, you'll only see toots from the people you follow or whom other people on your instance follow (this may not be exhaustive, the rules are quite complex). You may also set up a language filter, which is super handy if you can't read eg. French or Japanese, because those people toot A LOT. You can follow anyone in the network, even on GNU Social. Here's what the web UI looks like—a bit familiar, huh? And as for sustainability, it's up to you as a user, really. Most instance admins have a Liberapay or Patreon set up, so you can donate a couple cents a month to keep it afloat. The platform development is financed similarly, and it's, of course, all open source, so you can instead help with translations, fixing issues, etc. With enough active users, this might as well work out! Pick your instance from the list at instances.mastodon.xyz. There are thousands to choose from, some are topical, some general purpose. For example, there are francophone instances, Japanese instances, furry instances. Usually, when you open the instance's landing page, there is a short description. Alternatively, you can use the instance viewer to have a peek at their timelines. To search the list, I made a userscript that adds a MySQL-like search box. Install in in TamperMonkey or some similar browser extension. I guess you could also convert it to a bookmarklet. I recommend picking an instance that's up to date (at the time of writing, that's 1.4.1, but it advances quite rapidly), and also look for one with good uptime and a decent number of users. 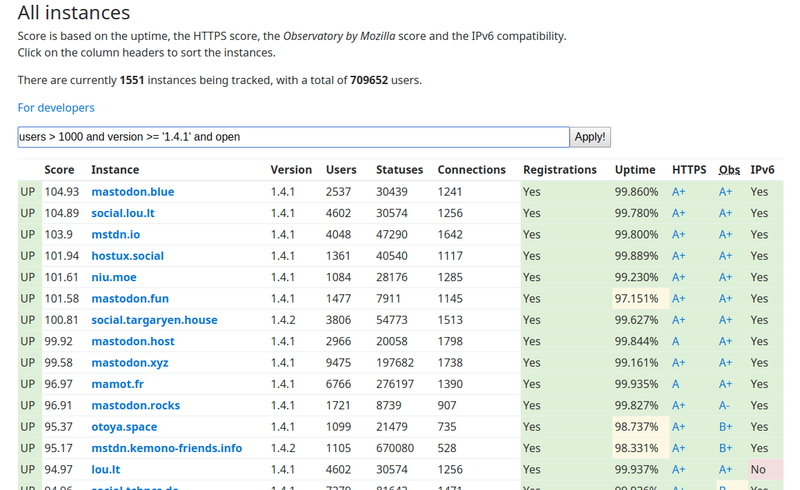 The HTTPS rating stuff is nice, but I wouldn't sweat that too much. B's are okay too. Make an account on the instance you picked, which claims your handle on that instance. There may be other users with the same name elsewhere in the network, it doesn't matter (other than being a little confusing). Now, to send and read toots, you log into your instance web UI or use an app like Tusky or Twidere. It supports 2FA and OAuth2. To get the most out of the platform, try following people you know from elsewhere, like Twitter. There are tools to find them, try googling a bit. Next, filter out languages you can't read, that'll make the public and local timelines much more useful. Article published 2017-06-10 by Ondřej Hruška.